The SIU Department of Geography and Environmental Resources focuses on environmental analysis at the undergraduate and graduate levels. Faculty expertise is in natural resources, land use change, environmental sustainability, climate science, and geospatial techniques. Field work, use of computers, and internships are prominent components of the integrated environmental problem-solving approach in both our under-graduate and graduate programs. Our students are building networks and empowering the local community through several campus organizations. 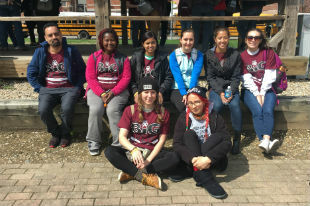 Specializations offered within the geography major at SIU give our students the skills and experience they need for the career options they want. Check out SIU's profile and rating from the Association for the Advancement of Sustainability in Higher Education (AASHE). 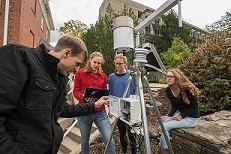 Dr. Trent Ford works with three undergraduate students to collect weather and soil observations from our portable station on the SIU campus. 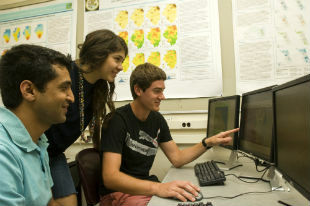 Geography Majors have opportunities to participate in faculty research projects.